Team Building training has become a most successful company training program! The Desmond is able to offer the option of conducting both seminar style instruction on history, etiquette and the psychology of the game in our conference center as well as providing interactive team activities in our golf center or at one of our golf course partners’ facilities. The game of golf is a great way to educate and energize your staff, plus provide a bit of diversion for meeting attendees. Team Building can be conducted in a two or a three hour segment and can be enjoyed by golfers and non-golfers alike. Prizes, trophies and awards are available. 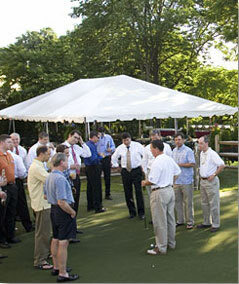 Team Building can be held on site or at one of our Golf Partner locations.